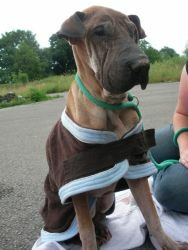 Please meet Jem, a Shar Pei who has come into the care of Rochdale Dog Rescue. 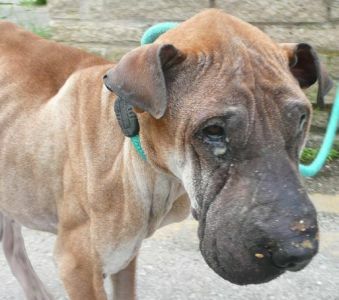 As you can see he is in a dreadful condition, severley emaciated and with infected looking eyes, sore skin and food is just passing straight through him. 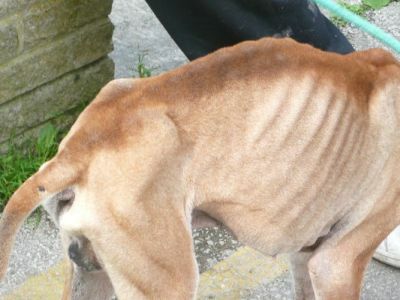 Jem is only a youngster and we can only guess at what has happened to him in the past to leave him in this condition. Thanks to one of our kind transporters he made is way into the care of our emergency boarding kennels on Friday 26th June 2009. 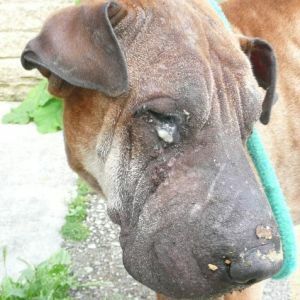 As you can see Jem is in a bad way and will need to spend alot of time at our boarding kennels whilst he undergoes all the necessary ongoing vets treatments to help him hopefully get better. 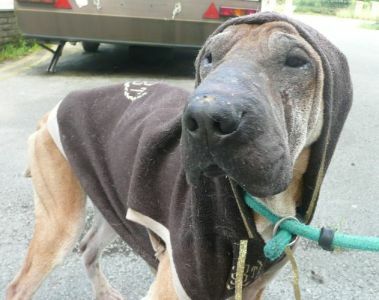 Jem must have been feeling ill for a long time and he will now be able to receive lots of TLC and all the care/ treatments he needs to help him. Despite how ill he must be feeling Jem has a lovely friendly and gentle temperament and seems to be settling in well so far and has had a clean-up and a nice hoody to keep him warm! 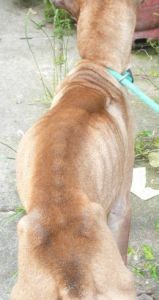 UPDATE 29 June 2009 : Feedback from the vets is that all his symptoms, gunky eyes, bad skin etc are just due to his poor condition and generally feeling unwell. There is no infection anywhere so his eyes just need to be kept clean, no meds needed. Unfortunately he does have a grade 2 heart murmour but that's not too bad. He has also undergone blood tests and we are awaiting the results. 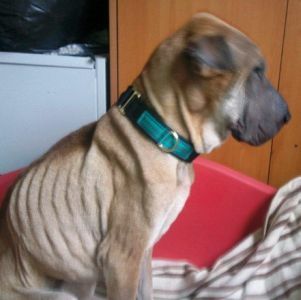 The volunteer who took him said he behaved perfectly at the vets for his examination. UPDATE 1st July 2009 : Jem is still very accepting, despite the fact he is feeling so ill, all he is doing is eating and sleeping. He still seems quite dehydrated but his digestion is slowly starting to improve. After all this he still trusts people... GOOD NEWS! The blood test results are back and although he's slightly anaemic and his protein is high there is nothing majorly wrong, kidneys and liver are fine. If he doesn't pick up in a week's time he has to go back but if he feels a little better then he can go back in 2 weeks instead. 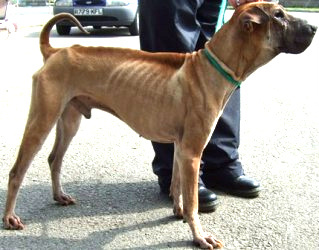 3rd July 2009 : Jem was stood at the front of his kennel barking this morning so he must be feeling a bit better! 6th July 2009 : Jem went to the vets today for his check up and he is doing fine, he has had an injection of steriods and antibiotics and has some tablets for his heart murmur. Jem also took a shine to Ally's daughter, although it could have been her tuna sandwich he liked the look of! 12th July 2009 : We had a little scare yesterday morning................Jem was sick. He was rushed off to the vets and kept in overnight just so that they could keep an eye on him but he's absolutely fine and is back with us today - after giving us all a fright! 13th July 2009 : There is good news and bad news on the Jem front. 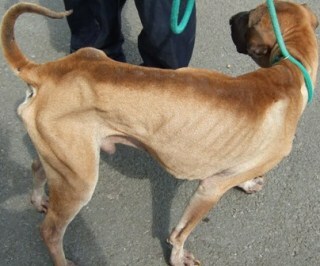 Firstly the bad news - unfortunately when Jem visited the vet again this morning he has lost weight. The vet felt that not only does he need feeding at least every hour, he also needs a reason to live, so......................he's to go home with Auntie Ally for some extra special TLC ! Update from Ally Jem is currently asleep in his bed in the hall snuggled up to a little teddy dalmation that my daughter has given him, after the vet saying he needs a reason to live i had no choice but to bring him home with me. He is having chappie little and often so hopefully when he goes for his check up on monday he will have put a little weight on. He has been getting lots of cuddles and the naughty boy barks when he wants attention and here's the best bit, he is wagging his tail!!!! 14th July 2009 : Well this little lad has been an angel overnight, not a peep and he is housetrained! He has been for a potter around the garden this morning and although he is unsure of the grass under his feet he is getting used to it and he has a nice raincoat to keep him dry! 15th July 2009 : It is with deep regret and great sadness that we have to announce the very sudden and unexpected death of Jem. He started to become ill in the earlier part of the evening last night, his breathing became heavy and he looked swollen around his rib cage and tummy. Ally rushed him to the emergency vets but unfortunately he lost his fight for life before he got there and he died in Ally's arms in the car park at the vets. 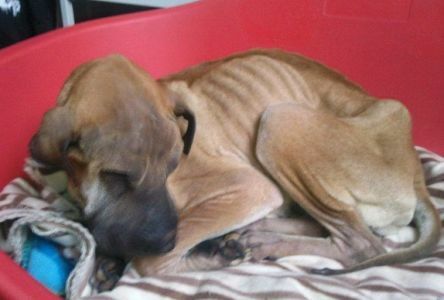 The vet said that he died due to a gastric torsion and that nobody could have done anything for him. All this happened in the space of less than an hour and we are all absolutely devastated that after trying so hard for him we lost him so quickly. We would like to thank everybody for all their help and support with Jem. Our only consolation at the moment is that at least he knew love and comfort towards the end. We are so sorry.